Author(s): Wilson M., Jarrett D., & Calladine J. Price: £12.00. If you wish to purchase a copy of a report please contact researchreports@bto.org. 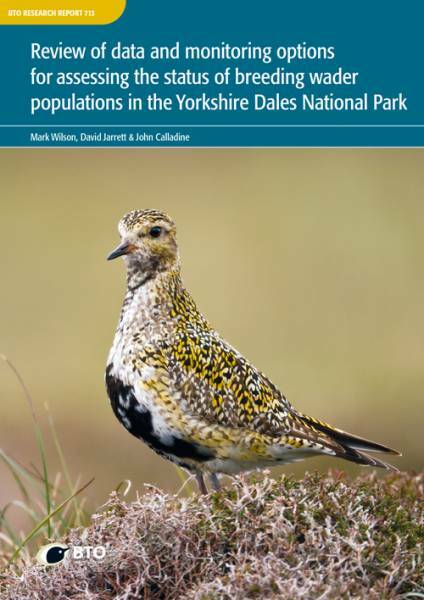 This report assesses the availability and quality of information relating to breeding populations of six of the most numerous wader species (Oystercatcher, Golden Plover, Lapwing, Snipe, Curlew, Redshank) in the YDNP. We make recommendations about how the ability of these datasets to inform the Park Authority (YDNPA) about wader population trends and distributions can be maintained or enhanced, and how this information can be deployed to inform planning for and management of waders in the YDNP.